If your plans don’t include a trip to the Caribbean, you can still enjoy a sense of the tropics in your own home. All you need are a few potted citrus plants. Many citrus trees are naturally dwarfing, meaning that even when grown in the ground they do not get much larger than 8 to 12 feet tall. This shorter stature makes them excellent candidates for container culture, and most varieties do not require pollination to set fruit. Just follow a few critical cultural tips to get them off to a good start. Choose the right container. A 12-inch diameter pot is an appropriate size for a 2- to 3-year old tree (3-year-old trees should begin to bear fruit). Plan to repot every year or two as the tree grows. Don’t start with an oversized pot, though, as doing so makes assessing moisture levels difficult. Whether you use a clay, plastic, or fiberglass container, ensure the pot has sufficient drainage holes. Don’t hesitate to drill more holes using a drill bit suited for your container’s material. Don’t add gravel to the bottom of the pot, as research shows this practice worsens drainage over time. Instead, use a soil-based potting mix with a ratio of 1 part perlite or bark to 3 parts soil. If your potting soil is heavier, you can add more perlite until it reaches this ratio, or you can add 1-inch of cedar shavings intended for small animal bedding. Mix the amendment so it’s well distributed throughout the container. Avoid using any potting mix with water-retaining granules or wetting agents, which can keep the tree too wet for too long. 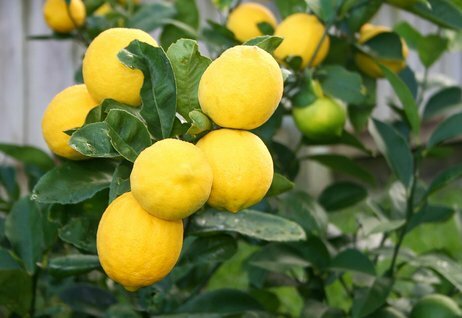 Citrus trees need to have sufficient moisture but should never be waterlogged. Your watering frequency will be directly related to the porosity of your soil and the dryness of your home’s air. Elevate the pot above any saucer so it never stands in water. When the surface soil dries out, use your finger, a pencil-sized wooden dowel, or an inexpensive soil moisture meter to check the subsurface moisture levels. Only water if the soil at the root level is dry. Deep watering once or twice a week will be healthier for your plant than frequent shallow watering. When transplanting citrus into a new container, make sure the root flare is visible above the soil line. The fibrous root mass should lie just under the soil’s surface. Keep soil and mulch off the trunk so as to prevent rot. Water deeply to settle any air pockets. Fertilize your container-grown plant with a slow-release fertilizer designed for citrus, or one with at least a 2-1-1 ratio of nitrogen to phosphorus and potassium. Check the label to ensure the fertilizer contains trace minerals like iron, copper, manganese, and boron, as citrus plants can suffer from micronutrient depletion. Supplemental or foliar feeding with kelp or fish emulsion can be beneficial, unless the aroma attracts your pets to dig in the container. Give indoor citrus as much sunlight as possible. Eight hours from a south- or southwest-facing window is best; if you can’t provide more than six, supplement with grow lights. Let the citrus spend the summers outdoors, but transition it to indoor conditions before freezing temperatures are forecast. Indoor-grown potted citrus can be susceptible to aphids, scales, and spider mites. Look on the undersides of the leaves for these pests and if you find them, wipe them off with a wet cloth or a spray solution of mild dish soap and water. Particularly bad infestations can be controlled with horticultural oil. ‘Improved Meyer Lemon’ and Kaffir limes are among the best-suited varieties for indoor culture, and both are fairly easy to find at garden centers. 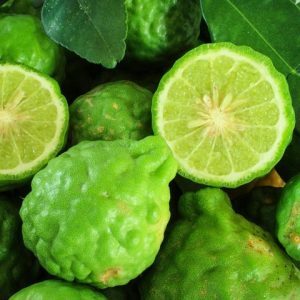 Kaffir limes have wrinkled skin and are frequently used in Asian cooking. The blooms of both plants will fill your home with gorgeous aromas. Featured image – Meyer lemon / Matthewjones | Dreamstime.com. Amy Hill is a Durham County Master Gardener and blogs about gardening at MissingHenryMitchell.com.